Today I am going to discuss how to build and package your own software for OpenWRT. When I say “your own software” in this case I am referring to a C program which you want to cross-compile for the target SoC and install using the opkg package manager included in OpenWRT. Let’s start with compiling the C file on your native architecture. Sure, you can just use cc/gcc from bash, but this isn’t any good to OpenWRT SDK, which expects that each package will have a makefile which can be used to compile the software. Most importantly above, we are including sqlite3.h for SQLite support, libconfig.h, and sys/stat.h, fcntl.h,errno.h to check if the SQLite3 database file exists or not. Okay, but how do we make this ready for OpenWRT SDK? By writing a makefile! 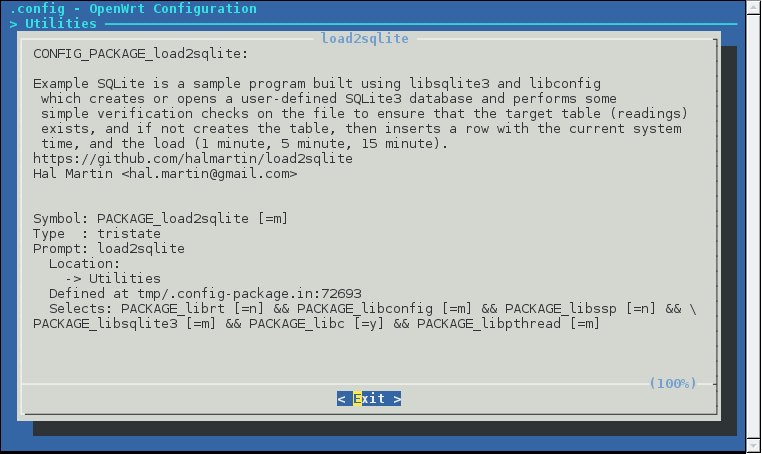 Okay, so now if you type make in the directory, magically you will end up with an executable called load2sqlite! But, this is a native binary, and it’s somewhat unlikely that your OpenWRT device is on the same architecture. If you run it, you’ll see that it looks for the sqlite database file, can’t find it, and so initalizes a new one with the “readings” table. Before we proceed further, I want to show you the directory structure so you have an idea of where we just were when we did this compilation. We are currently in the the src directory. Now let’s move up to the load2sqlite directory and work on the OpenWRT Makefile (seen above). time, and the load (1 minute, 5 minute, 15 minute). If you clone the OpenWRT source and take a look at basically any package, you’ll see a Makefile that looks similar to the one above. Here is where we define core details of our package, such as the name (e.g. what opkg will know it as), the version (useful for upgrading later), maintainer, and license. Since we want to build a program which links against external libraries, we must also tell the compiler where to find the header files for these libraries, so that the linking process does not fail during compilation. Above you can see that we are linking to libconfig and sqlite libraries. This is where you define the package for the OpenWRT build system and declare things like dependencies, and the description that will be present when you run menuconfig (which is how you will select your package to be built as part of an image). Without declaring dependencies, you may find that you can build, package, and install your software, but it won’t run! So, by declaring the dependencies (packages which provide the libraries we link against) we ensure that when we type opkg install load2sqlite and libconfig and libsqlite3 are not installed, opkg knows to go and install them before installing our program. Now we can safely run the program because all the required libraries are installed on the device! Since our utility is quite simple, as *NIX software goes, the preparation steps are to create the build directory and copy the source from the source directory to the build directory. Since there is nothing to configure in our sample program, the configure step is empty (otherwise the OpenWRT build system will attempt to configure the package and fail because we haven’t bothered to implement this). Finally, compile and install the software. As you can see above, I didn’t include an install directive in the makefile of the application, it is instead done manually within the OpenWRT Makefile. This is your choice, since I was designing this program specifically to run on OpenWRT, I saw no need to incorporate the installation steps in the makefile of the program. This line is required for OpenWRT to build the package. Forget this line, and you will sit there wondering why your package is not being built! Okay, now we have prepared our software to be built for OpenWRT. It would be stupid of me to get this far and not tell you how to compile it using the OpenWRT toolchain! Following the excellent OpenWRT documentation, we need to set up a buildroot. Follow step 4 to ensure you have all the required dependencies installed on your host system! # don't forget to copy load2sqlite to package/utils/ before running this step, or the package won't appear in the menu! Now I already have an official OpenWRT build installed on my router, so I don’t need to build an entire image, just the package I want to install. To do this, we must first build the cross compilation toolchain required to compile for a different CPU architecture. Warning: the OpenWRT buildroot is around 6GB on disk, so ensure you have the necessary space before starting! Now that our package is installed, we can test it! Since this is just an example program, it is one-shot (e.g. not a daemon). If you really do want to track the load of our OpenWRT router, just add /bin/load2sqlite to crontab (e.g. every hour) and you’ll have this tracking info in the SQLite database. Note that by default the file is saved to /tmp/, which on OpenWRT is a ramdisk. This means that the file will be lost when you reboot, or if you leave it running unattended for too long, the file size will grow to the point where the ramdisk will consume all available memory and the router will crash. For this reason, I suggest you modify the configuration file /etc/config/load2sqlite to point to non-volatile storage (such as a USB stick). Why write another OpenWRT software guide? Well, while I was looking for resources on how to build and package software for OpenWRT, I ran into a lot of posts about people compiling simple “Hello World” programs for OpenWRT, but for my particular use case, I wanted to utilize multiple libraries in my program, and I couldn’t find any good instructions on how to compile a program with linked libraries for OpenWRT. Disclaimer: I’m not a C expert, so maybe there are some headers there which are not strictly necessary, but it works for me and the executable size is quite small. I have tested this on Chaos Calmer (15.05), and I expect the instructions would also work on Barrier Breaker (14.07) however I didn’t try this, so I cannot say certainly that it will work. This entry was posted in Embedded, Linux and tagged lede, makefile, openwrt on 2015/10/31 by Hal Martin.